A Winner... and a Book Birthday! 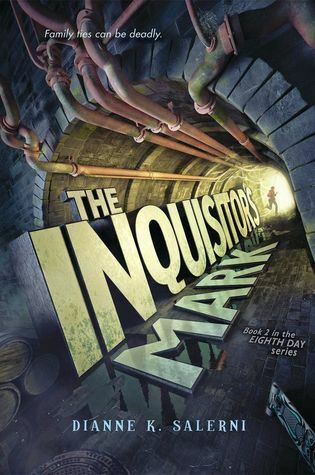 The grooviest happening this week is the book birthday of THE INQUISITOR'S MARK, my Project Mayhem colleague, Dianne Salerni's latest. Publication date is the 27th! I loved the first book in this series, THE EIGHTH DAY, (see my review and interview with Dianne from last year), and the sequel doesn't disappoint. Dianne is really skillful at creating tension and writing action scenes--and I am zipping through it, but not quite ready to post my review till next week. Okay, back to reading. (Yikes, Jax and friends are being chased through the New York zoo by guys shooting tranquilizer darts. I can hardly breathe!) Have a great week, mafiosi! Sometimes, if you're a really lucky mafioso, you stumble upon a book which makes you believe it was written just for you. 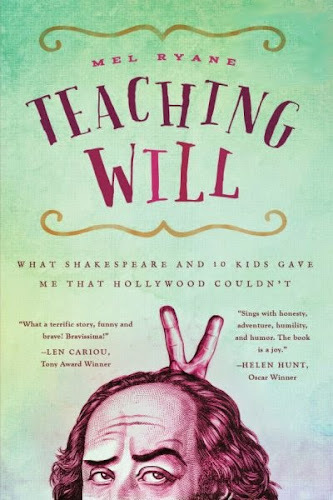 Teaching Will: What Shakespeare and 10 Kids Gave Me That Hollywood Couldn't is just such a book. Anyone who knows me, knows that I am a complete Shakespeare nut. Add to this the fact that I have two children who spend a great portion of their lives on stage (for child #3 it's the basketball court, but you can't win 'em all)--and I was totally enthralled by Mel Ryan's funny, honest, and ultimately touching portrayal about what it's like, without any formal educational training, to start a Shakespeare Club in a lower-income school. What It's About: (from the back cover blurb) ~ "Power. Revenge. Love. Shakespeare's themes can be found in any schoolyard. And so a naive Mel Ryane volunteers to create The Shakespeare Club at a public school--for kids who have never seen a play, much less acted in one. With a lifetime of theatrical experience but zero classroom skills, Mel throws herself into this rollicking adventure expecting to inspire young lives. Alas, the first lesson: beware of expectations." Opening Lines: "Did you know him?" "Oh no, William Shakespeare lived over four hundred and forty years ago." "Yeah, but did you know him?" Twelve sets of eyes scope me out as I sit in front of them. Two boys and ten girls from the third, fourth, and fifth grades. Russell Crowe, Colosseum... I get it. These tiny Romans are salivating over my certain death. My mouth trembles as I smile, slapping on a sunny disposition. "No... sad to say, I've never actually met the man." Why I Loved It: As you can see from the above opening, Mel Ryan has an engaging writing style. She draws us immediately into the scene, and it's not much longer--while she is being badgered about her acting past by one of the students--that she writes: "God, give it up! I want to scream, but you shouldn't scream at children. That's never a good idea, and certainly not at the very first meeting." When I read that, I knew I was in excellent hands. I loved the way the book is set out. Ryane begins each chapter with a Shakespearean quotation. Each chapter also has insets, where she quotes from the children s' journals, as well as sharing a thought about what she herself has learned, under "Lesson Plans." Throughout the narrative, Ryan intersperses anecdotes about her early life, conversations with her husband, and memories of her life on the stage and what it means to be an actor. None of this experience is sugarcoated. The children are challenging, and Ryane is honest about the frustration she experiences. But, as they work towards putting on A Midsummer Night's Dream, they all begin to find the closeness that being cast in an acting performance brings. As Mel Ryane writes: "During our battles, I never thought the kids would deliver anything beyond an ordinary recitation of the play. I was wrong. These ten kids held hands and climbed a golden mountain... together." This is a wonderful book, and I recommend it to anyone who loves Shakespeare, who works with kids, and who loves the stage. E.B. White (Charlotte's Web), C.S. Lewis (The Lion, the Witch and the Wardrobe), Laura Ingalls Wilder (the Little House series). To this day I fantasize of being in Wilder's little snowbound house on the prairie. The Love of a Good Woman by Alice Munro and Sea Creatures by Susanna Daniel. I especially like Chapter XIV, "War Declared." The Shakespeare Club meets in the library that week because we've been kicked out of our regular classroom. The kids start a paper fight and I just lose it. In that moment I remember my own seventh-grade self in our school library with our poor librarian completely losing control of chaotic kids. It reminds me that children view their job as gaining power from adults. It's kind of a battle and the adult, being the adult, has to finesse the upper hand. Tough stuff for any teacher, parent or coach. I'm really lousy at a longer list of things, but since you didn't ask…. Leftovers! I'm not really a fan of traditional breakfast foods but I love spaghetti for breakfast, or a salad with a poached egg on top, or a tuna sandwich. All with strong coffee, of course. Following a distinguished career as a classically trained actor onstage and in film and television, Mel Ryane has found a new artistic home in the written word with her memoir, Teaching Will: What Shakespeare and 10 Kids Gave Me That Hollywood Couldn't. Mel became a professional actor during her teens in her native Canada, and then followed her career to New York City and to theatres across North America. 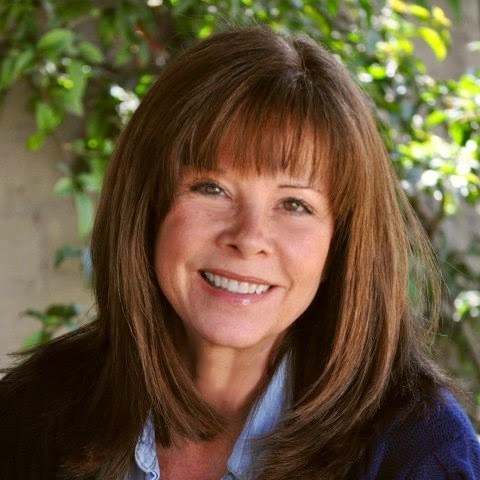 After applying her skills to coaching actors on major studio and network projects, Mel was accepted into the Directing Workshop for Women at the prestigious American Film Institute. She subsequently wrote a screenplay that advanced to the semifinal round in the Motion Picture Academy's Nicholl Fellowships in Screenwriting competition. Mel travels across the country teaching "From Page to Podium: Reading Your Work Aloud," a workshop that helps writers find their public speaking voice. She also offers school workshops introducing Shakespeare to students. She lives in Los Angeles with her husband, their dog and cat. I am also delighted to be able to giveaway a copy of this great book, courtesy of Ms. Ryane's publicist, Darlene Chan. All you have to do is leave a comment, telling me what your favorite Shakespeare play is. Ciao! But que sera, sera. We are excited for the kids (in the Don's case, the grandkids) to go back to school so that we can have a couple of hours a day dedicated to bringing you all things middle grade. We're excited about all of the Marvelous Middle Grade Monday books we hope to feature during the next couple of months--and, being betting men, we are particularly eager to see how the Cybils awards play out. The Cybils shortlists were announced on New Year's Day, and boy oh boy did they start 2015 off with a bang! I was particularly pleased to see my friend Tara Dairman's novel, ALL FOUR STARS, make the list, as well as Megan Jean Sovern's THE MEANING OF MAGGIE, which I reviewed in May of 2014. Lots of good books to read! I look forward to visiting blogs old and new this year, and continuing to make meaningful connections with those who love middle grade fiction.